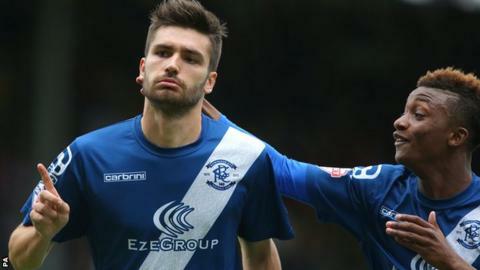 Birmingham City attacking midfielder Jon Toral says starting matches is making a big difference to his game. The 20-year-old Spaniard is on loan at St Andrew's from Arsenal and has repaid Blues boss Gary Rowett's faith by scoring in his first two appearances. "I have to thank the team and the gaffer for giving me the confidence," Toral, who spent last season on loan at Brentford, told BBC WM 95.6. "It's been a great start for me and I need to keep it going." Toral, who is yet to break into the Gunners' first team, played 34 times in the Championship for the Bees in 2014-15, but 26 of those appearances came from the bench. Toral joined the academy at Barcelona when he was eight years old. He signed for Arsenal, along with Hector Bellerin, for £300,000 in August 2011. A regular in the Gunners' reserves, he was part of the senior squad for their pre-season tour to Singapore this summer. Toral agreed a new one-year contract at the Emirates Stadium after spending last season on loan at Brentford, where he scored six times in 37 games. Under Rowett, Toral has been given the chance to impress from the start in a role behind the main striker and netted in Birmingham's opening-day win against Reading and Saturday's 2-2 draw at Burnley. "He explained how he wanted the team to play and it's a good way for me to help," Toral added. "It's great to play with a striker like Clayts (Clayton Donaldson) with his flicks and he gives so much the way he holds the ball up." Toral's impact has impressed Rowett, who is hoping he can now go from strength to strength. "Jon has an instinct to read the game well and get in good positions," the Blues boss said. "When he gets into goal-scoring positions he's got real composure - that's two in two league games now."